You deserve to have a dentist with experience to help you transform your smile. Dentist Dr Caroline Oh is a top Invisalign provider in the Sydney area. Passionate about the outcomes that are achievable with this technology, she’s completed Invisalign training overseas with some of the foremost experts. We’ve seen hundreds of patients attain remarkable results. In addition, Invisalign does not require you to watch what you eat and drink as you can remove the aligners during meals or while you’re having a drink. This convenience makes brushing, flossing and maintaining your oral hygiene an easy process throughout your treatment. With treatment usually lasting for about 12 months or more, Invisalign is a comfortable, easy and virtually invisible way to address issues such as crowded, crooked or gapped teeth giving you a bright, healthy smile. Read on to find out more and why you might want to consider coming in for your first Invisalign consultation. Appearance. People won’t be able to easily see that you’re straightening your smile. Comfort. With no hard brackets or wires, you won’t risk your tongue or gums rubbing on hard brackets or wires. Convenience. You can remove your aligners when you eat. Hygiene. Since the aligners are removable, you can brush and floss your teeth as usual. Dr Caroline will take photos and bite impression of your teeth. This information is then sent to Align Technology, where they’ll create images of the progression of your teeth movement. We’ll ensure these are the results you want, then have your custom aligners manufactured. Each aligner is worn for two weeks, comfortably shifting your teeth into the desired position. The aligners are custom-created to exert the precise pressure required to get the results you want. As long as your aligners are worn for the necessary amount of time, your teeth should move exactly as described by the software program. 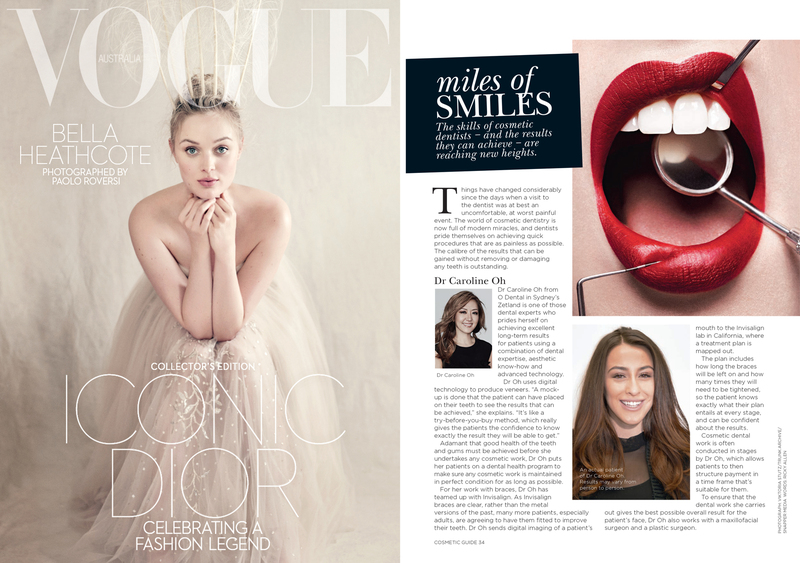 To find out more about Invisalign in Zetland, check out our feature in Vogue magazine!